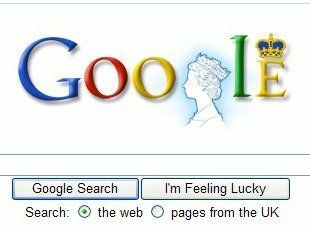 A picture of the Queen has appeared in Google's logo on their UK search page. The Queen's profile makes an appearance in the 'Google doodle' to mark her majesty's visit to the company's UK headquarters. The logo will run for just a day – as the company crowns (ahem) a good year with a high profile royal visit. The British royal family is certainly not shy when it comes to embracing technology – and has been running a YouTube channel since the end of last year. Google employees will show Queen Elizabeth and Prince Philip several of Google's key business areas, including the search engine that catapulted the company to world dominance. The Google doodle has become an increasingly iconic symbol of events – with changes reflecting events as diverse as the Olympic Games and St Patrick's Day.